Today was perhaps the most engaging excursion of my entire safari to date. In this day of progress and enlightenment, to imagine that there still remain such primitives in the wilder reaches of the land renders the faculties insensate. 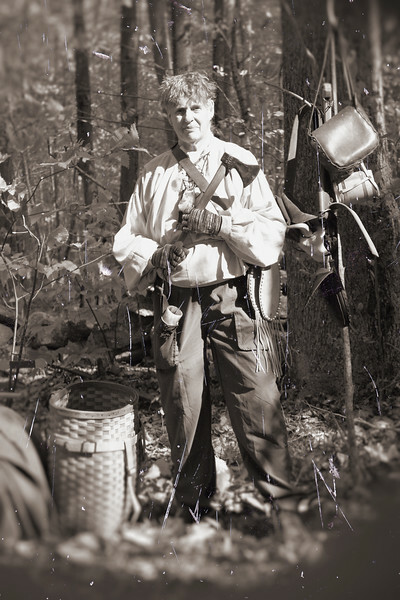 To be certain, it is hardly to be expected that the rural reaches of the Connecticut River valley would harbor the civility and gentility of Boston or the new York city, but even so, I was amazed by the strength of the Human spirit to conquer the wild in its native habit. But I get ahead of myself. While touring the sylvan farms and fields of the Eastern stretches of Connecticut in my attempt to document this fair countryside before the evils of industry leave their dark stain on this pristine agricultural land, I heard tell of a group of young men, led by strong willed leaders to for a band, yea, even a Troop of wilderness survivors. "Mountain Men" they called themselves, and I wished to capture this last breed in all their dignity before time and progress pushed them into extinction. I was directed to a wise medicine woman who led me and my party into the wilderness along tracks faint and obscure, and known only to her. In due time we came across their encampment, where I found them to be a jovial band of hardscrabble wild men, dressed in shifts and leather, eking out a living off the bounty the great forest could provide. 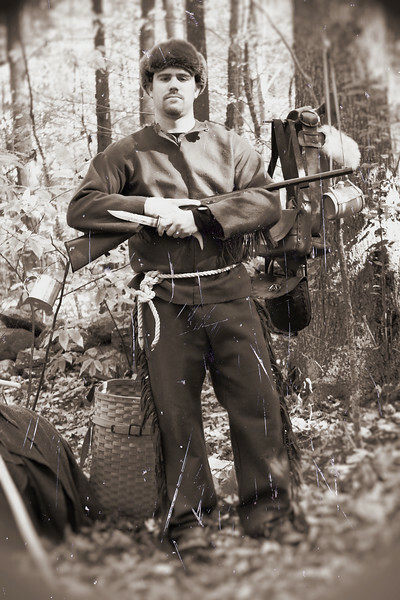 They were hard at work honing the skills of youth in the merits of survival, firing black powder and throwing Tomahawks at wooden targets. After befriending their leadership, I offered to extract my wet plate camera and photograph their condition, an offer heartily accepted. 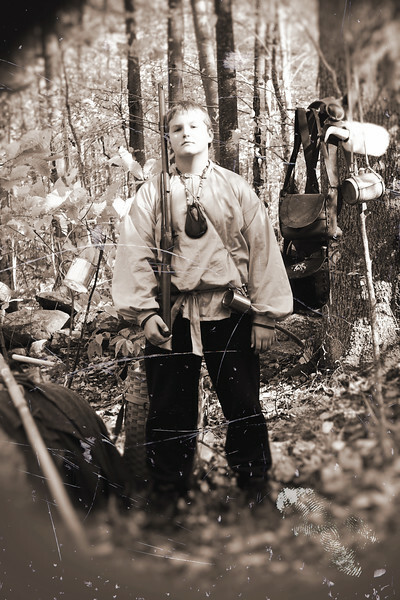 I spent some time among them, learning their ways, as the youth in my party learned the ways of the woodsman from the wise medicine woman, and was even offered gifts of clothing, a medicine bag, and other items of great value to them. In fact I feel that i have been accepted as one of them, and after having taken portraits of their community, was invited to return once more and take up a place among them as we left. Do not fear, my sweet Prudence, for I doubt that I shall ever find my way back through that dense wilderness to join their merry band, and thus, joyfully return to your constant arms once more, when my tenure on this assignment ends. 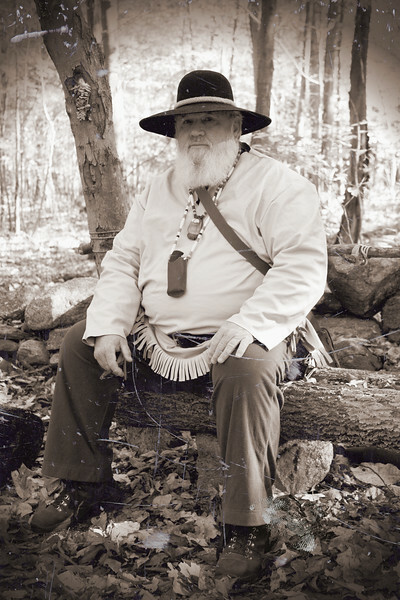 I'd like to thank Boy Scout Troop 124, Andover for the invitation to photograph their mountain man camp out. 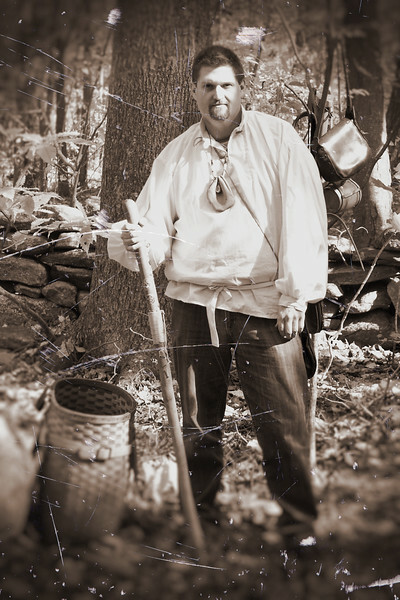 I hope all the boys and leaders enjoyed the "Olde tyme" photo session as much as I did. 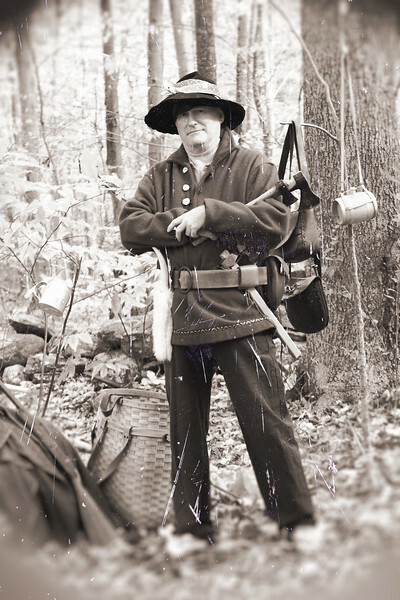 This is an example of a vintage effect for period photos. The campers made their own outfits for this one, and some of them were fantastic.